Isn’t winning a reason to celebrate? Not for Fox News. 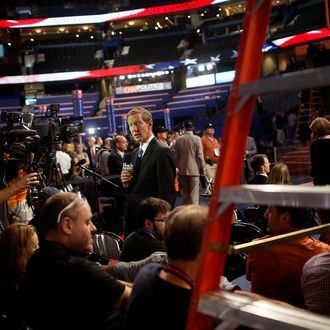 At last week’s Republican National Convention, Fox crushed its television news rivals with some 9.1 million viewers when Clint Eastwood and his empty chair took the stage — a two-to-one margin over rival cable and broadcast networks. But despite the ratings dominance, Fox has a minimal public footprint at the conventions. While most news organizations throw open their doors to host parties and policy panels, Fox News is eschewing any marketing frippery. Meanwhile, Fox remains walled off from journalists and politicians circling through the convention. In Tampa last week, a pair of burly security guards manned the door to the Fox News green room in the Tampa Bay Times Forum. In Charlotte, Fox’s turf is on a far side of the convention hall marked by a small sign that reads “Fox News Workspace.” Last week, the network hosted an invitation-only party for executives from their affiliates, and it will host another affiliate party tomorrow. But that’s about it. One of the most striking aspects of Fox’s success is how little interaction the network has with the rest of the media. For one thing, Fox News doesn’t need the marketing. Ailes’s network is dominant, and he surely knows that hosting a party or a policy symposium would likely do nothing to boost ratings. Another is secrecy: Fox does not tolerate leaks and generally controls contact between producers and on-air talent and the press. Hosting a cocktail party is not their style.